By Car: From Bangkok, drive along Highway No. 35, passing Samut Sakon and Samut Songkhram Provinces and then take Highway No. 4, south to Hua Hin. The total distance is 180 kilometers. Alternatively, it is possible to travel via Nakhon Pathom and Ratchaburi Provinces, from Bangkok to Hua Hin. From Airport: Leaving Airport, look for signs (Bangkok-Chon Buri Highway) # 34 into Bangkok, watch for signs that read Dao Khanong, Thon Buri. After crossing over Rama IX bridge, drive approx. 1.5 hours along Highway # 35 (Thon Buri – Pak Tho route) via Samut Songkhram and Samut Sakhon. The highway turns to the left into Highway # 4 (Phetkasem Road) continue to drive 1 hour via Phetchaburi and Cha Am to Hua Hin, Prachuap Khiri Khan. The total distance approx. 200 kilometres. Private transportation can be arranged from Bangkok Airport or from your hotel in Bangkok to Blue Lagoon Resort, please contact us for details. The trip takes approximately 2 hrs. 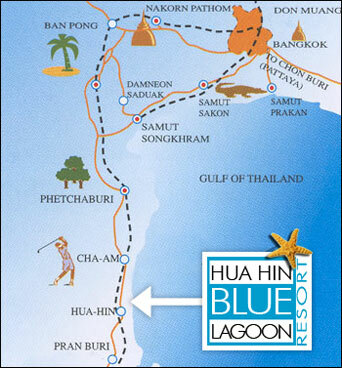 By Air: SGA Airlines provides three (3) flights daily to Hua Hin (45 minutes). For more information, please contact SGA Airport office, Bangkok (66) (0) 2664 6099, or Hua Hin office (66) (0)3252 2300, or www.sga.co.th Because of low season the SGA airlines have stopped all three (3) daily flights between Bangkok and Hua Hin. By Bus: Several trips can be taken daily from Southern Bus Terminal in Bangkok. The trip takes about 3 to 3.5 hours. By Minivan: Various agencies in Bangkok operate private minivans to Hua Hin. At the Victoria Monument, minivans leave every 30 minutes from 6am-8pm everyday. The trip takes approximately 2.5 hours. Blue Lagoon Resort have minivans that are available for airport pickup and departure. For bookings and rates, please contact us.